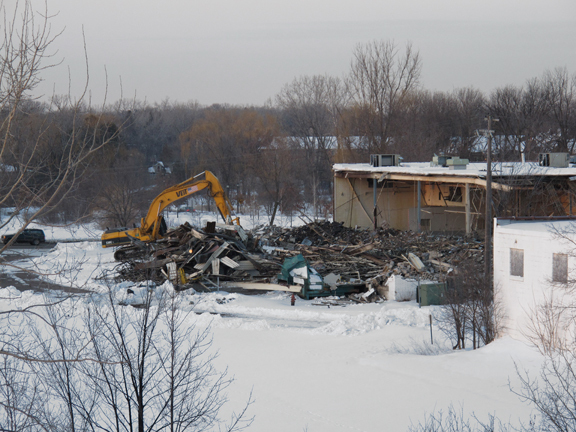 The big source of entertainment at work today was watching the demolition of an abandoned building across the street. My colleagues and I lined up along the windows several times to watch the progress, and we cheered enthusiastically when a big chunk of the roof collapsed. Too bad I didn’t have the presence of mind (or the time) to shoot some time-lapse photos. It really was fascinating to watch the deconstruction of the building, to see its hidden structure emerge: The building’s destruction was actually creating something entirely new. I couldn’t help but draw a parallel when a colleague forwarded a link to Brian Dettmer’s art. I’ve never seen more beautiful, more mind-boggling proof that destruction and creation often go hand-in-hand. Cool post, and thanks for the visual proof. Very creative creation! I am fascinated by these pieces. Thank you for sharing the reconstruction of destruction. That’s the first I’ve heard of Brian Dettmer — great stuff. Thanks! I have a new favorite artist. That is AMAZING! And I love the message behind it — and the fact that it cherishes works of art in their own right, the very books from which he creates new art. Love it. Wow, those are stunning works of art! Thank you so much for sharing them. And congrats on being Freshly Pressed! 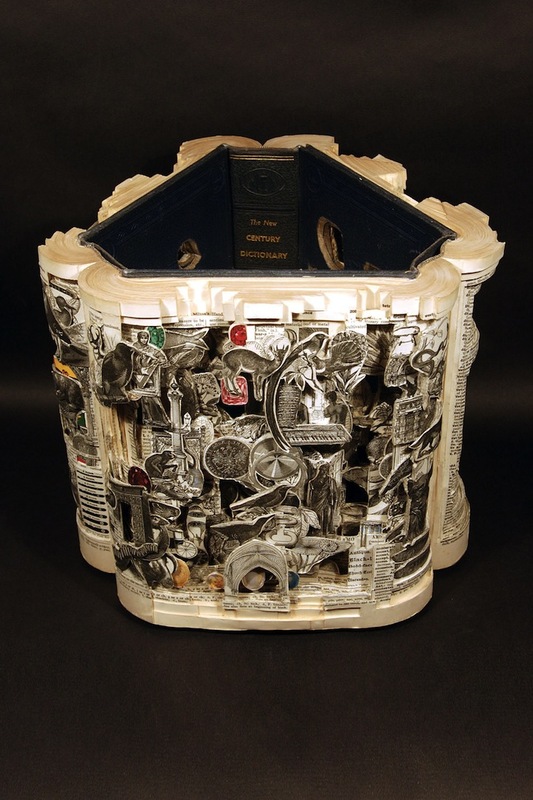 Those book sculptures are really awesome. Talk about talent. Those are awesome pictures! Thanks for sharing! This is truly artistic! It reminds me of the artist who makes tiny little sculptures ontop of a PENCIL! It’s amazing to see the tip of a pencil turn into a masterpiece. Thanks for sharing. Wow, that art is amazing! Thanks for sharing. Wow! “Amazing” doesn’t even begin to describe Dettmer’s beautiful work! Thank you for introducing me to the “Book Surgeon’s” art, congratulations on being Freshly Pressed, and please check out my post “D is for Destruction” if you get a chance. It’s about how much I also enjoy a good demolition project every once in a while. nobody has commented yet? those books are gorgeous and probably the fruit of long hours of tedious work. Holy crap. I have never seen anything like that. Beautiful. My favorite is the 4th. I clicked on your link and bookmarked the artist’s site. #4 is one of my favorites, too. Thanks for commenting! Wow – those books are totally amazing. What a creation! Great comparison. That is one talented and creative person there! Thanks so much for sharing this and the link. I’m sure the artist will be happy you did that, too. So nice. Yeah, I’ve got to admit that I did a bit of cheering as the roof caved in. It was just so … monumental. Anyway, thanks for your comment! I see that cycle happen in my life… have to give up the old, tired habits, reactions, negative thoughts to bring in freshness and congruency with what makes you true to yourself and feel alive. The sculptures are amazing and I love your post! Thanks for sharing! Some people are so talented it boggles my mind. While not completely relative, this post gives me the same vibe as I get from the Japanese concept called “wabi-sabi.” Wabi sabi, which many are aware, essentially celebrates the beauty found within life’s imperfections and the natural wear and tear brought on by neglect or the passing of time. After Effects: Moldy Miniature Homes Left to Decay by Italian artist Daniele Del Nero. Hauntingly beautiful. Captured: The Ruins of Detroit. Tragically, beautifully sad. Wonderful post and congrats for the FP profile! LOVE the wabi-sabi tie-in! Thanks for the interesting links, and for your kind words. Very creative! How could people get so many ideas. These are beautiful! 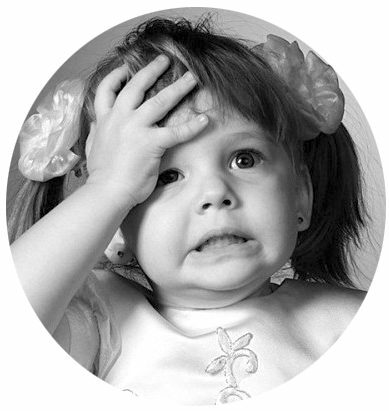 I actually just posted on this theme of destroy to create here http://bit.ly/fdWIMO. It’s a concept I’m still trying to be brave enough to try. *Loved* your post! I can’t imagine throwing something so beautiful off a bridge — and in the process, losing it forever. But the article was right: The act of destruction make that letterform all the more rare and beautiful. I also like the zen overtones of non-attachment. Some people think that, to truly flourish as human beings, we have to let go of the things we most love. I’ve always been intrigued by the concept, but I’ve never quite been able to bring myself to throw my iPhone into the Mississippi. 🙂 Anyway, thanks so much for your comment. And keep writing! Amazing artwork. It’s a different view of the creative process. Thank you for sharing. Wow – what amazing works of art. it’s incredible what the human mind can think up. Thanks for posting this. Destruction and creation are at the exact same point in a never-ending circle, which is life…! It’s amazing how art and it’s beauty can be found in anything. Your thesis, out of destruction, creation, the same can be said for nature. I witnessed the eruption of Mt St Helen 30 years ago. I saw close up the aftermath, the destruction it left. But in the midst of all this I saw a wild flower trying it’s best to bloom among flattened trees and a blackened pond. Thank you for sharing such beautiful art, and congrats on being freshly pressed! How AMAZING!!!!! Are those books! Had never heard of Brian Dettemr before… thanks for posting these!!! I’m very curious about the artist’s mental process, too. Never in a million years would the concept have occurred to me — let alone the ability to execute it. I’m thinking about trying to track him down to see if he’d be willing to do an “interview” with HBlog. I’ll keep you posted. Thanks for your comment! That art is just amazing! Thank you for sharing. Wow, true works of art! I didn’t even know that anyone did, or could do, that. Thanks for the post! Those are incredible pieces. Thank you for introducing me to Brian Dettmer. I have similar thoughts when I see a stray weed or blade of grass that has forced its way through a sidewalk after a heavy rain. Beautiful post. Thanks for your thoughts. Stunningly creative. Thanks for the share. that is so dope. the mind’s imagination is crazy.love the art. thanks for sharing! 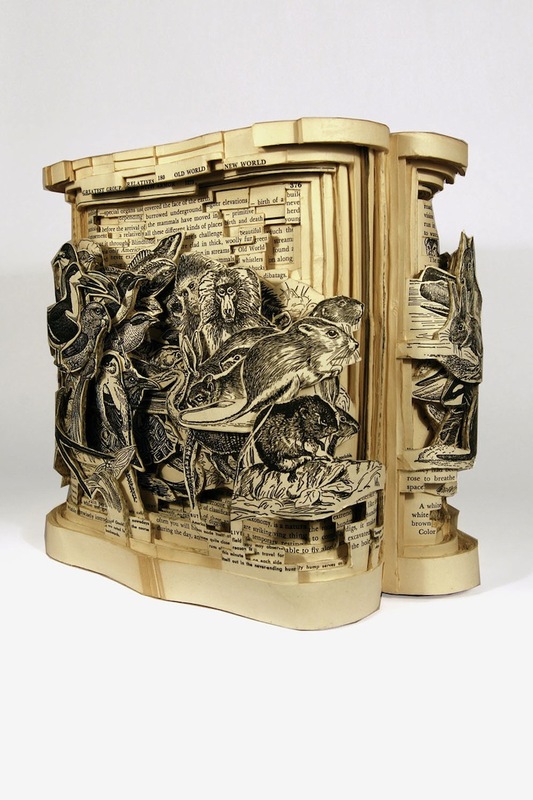 Really intrigued by the reconstruction- reconstruction of books. However, the sad truth about most house demolitions, is that almast always those worn pieces of what used to be a house, will end up in land fill somewhere, because reusing and reconstructing with them is too time-consuming and expensive. I’d like to see something similar for the building industry…. Wow! That is some of the most beautiful art I’ve ever been witness to. I need to find out more about this artist. Thanks for sharing and congrats on being FP! I’ve written Brian in hopes of doing an “online interview.” I’ll post it on HBlog if he agrees. Thanks for reading — and thanks for your kind comment! I am so-loving this; such creativity! Amazing stuff – truly. Thanks for sharing and congrats on becoming FP! Some artists are sooooooo cleaver it’s mind boggling! I’ve never heard of Brian Dettmer or Doublebooked Designs (in the comment above) and love them both. I’m particularly interested as I’ve published a book and wonder if one day someone may create something just as beautiful out of what I myself have created. Inspiring stuff… thanks. Amazing! When I see creativity like this it make my heart swell for the human race. The first one and the 4th one are the ones which caught my eye. When I first saw the pics, without reading your post, I was wondering as to what it was. Just admired as some art. 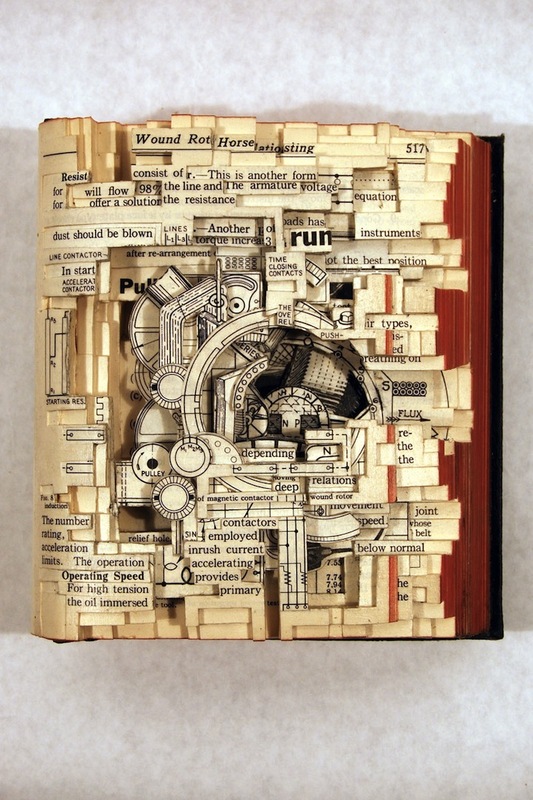 It is actually made out of real books, Lovely. Fascinating! Now an instant fan of Dettmer. Thanks Fresh Press and you! 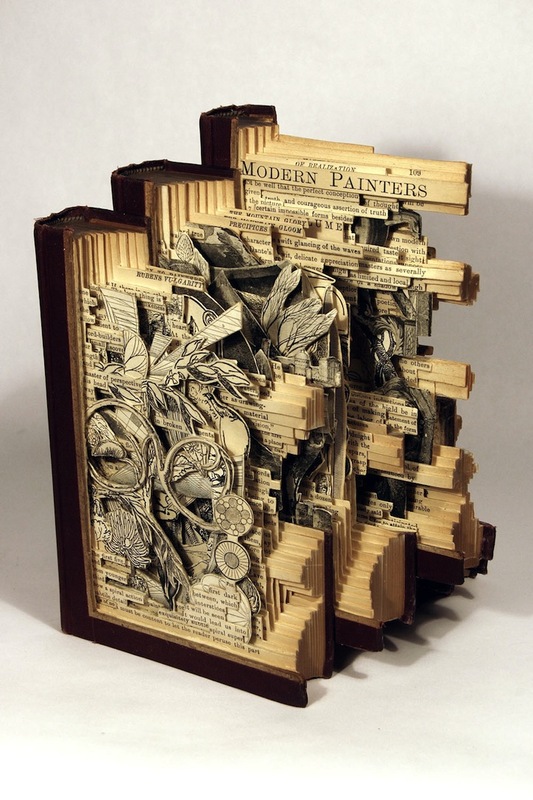 This is phenomenal…I would not have guessed these were made from books..he is very creative. I love watching machines work, whether it’s demolishing a building, emptying a dumpster, changing a road sign. Somehow it is fascinating to look out the window and watch these things go on. The ouroborus, too, comes to mind. Creation and destruction are often linked. Absolutely stunning! Great post, and very inspiring! I recently started using cut paper as a medium in my studio and I think I’m in love! That is probably the last thing if any that could ever come to someone’s mind.. creation from destruction .. deconstruction..
Ezcellent blog work and congrats on getting pressed. it’s really funny, inspiring. i want the last one! Not only do I love that art work but I love the message too. I have just written a blog along similar lines, out of what seems like bad or old, good comes! I’m just about to be made redundant but I’m taking the opportunity to start a business. Blogs like yours make me feel inspired, thank you! Thanks for the kind words. I, too, found myself “redundant” in 2007. As your recent post states so well, at the time it felt like a crisis. But with the benefit of hindsight, I now realize that the it provided opportunities I never knew even existed. So take courage and embrace the moment. I have no doubt that you’ll land on your feet — and that your life will be fuller, too. All my best, H.
Nice pics. And thanks for reminding us of a basic law of physics…nothing is ever really created or destroyed, just reconfigured from one form to another. Unless we’re God. Fascinating pics. Congrats on being FP’d! These are incredible! Thanks for posting. Not only is it cool art, these magnificent pieces represent a huge amount of energy and work. Thanks for sharing. 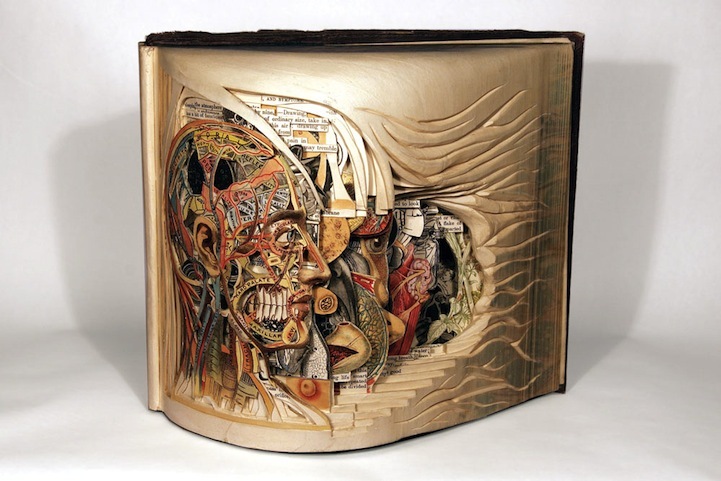 Wunderful Book-Art … – … new Generation in IT-time? There aren’t many things labelled as art that make me literally stop and stare – let alone urge me to quell the instant need to email all of my friends so I can share it. Great post – amazing artwork! My jaw literally dropped when I saw the images. I superduper like this one!